Once upon a time, in years gone by, I used to sew most of my own clothes. For about 30 years I sewed a range of outfits for myself and even for some friends. But then.......patterns started not fitting, I would have to choose a size more than 5 - 6 times larger than I was wearing according to the measurements on the pattern & still they either didn't fit or were out of proportion for my short, 'cuddly' self. So for nearly 10 years I have not made a single item of clothing for myself. But then, along came Pearl Red Moon with her Zelda top! The combinations of fabric, layout, contrast or feature pieces are endless with this pattern as well as 3 options for neckline finish. 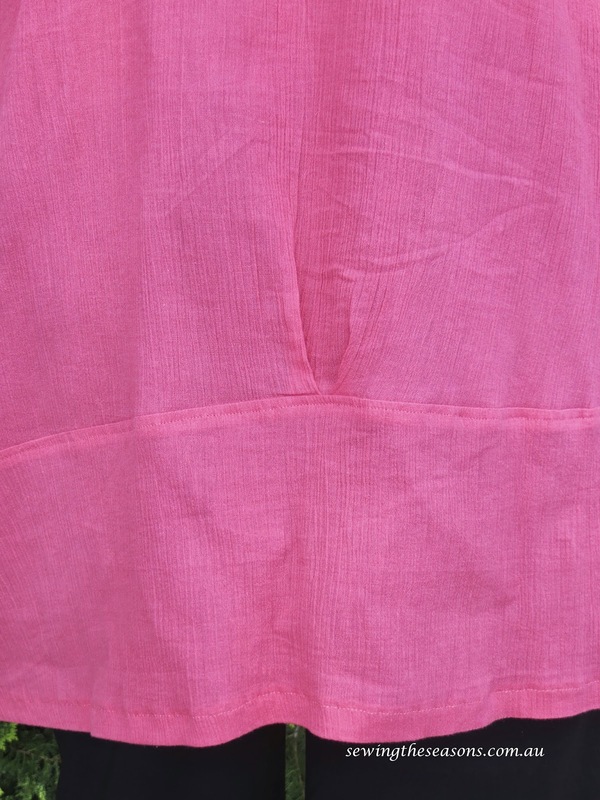 It can be made from knit, cotton, voile or any fabric with a soft drape. There are guidelines on the pattern layout if you decide to combine different fabrics for different pieces in the top as well. I was so excited yet somewhat nervous to be accepted to do my first pattern test. I have seen friends make some wonderful clothes for their children and was on the look out for the possibility to try one for myself. I saw the call out for pattern testers & decided it was time to be brave & have a go. 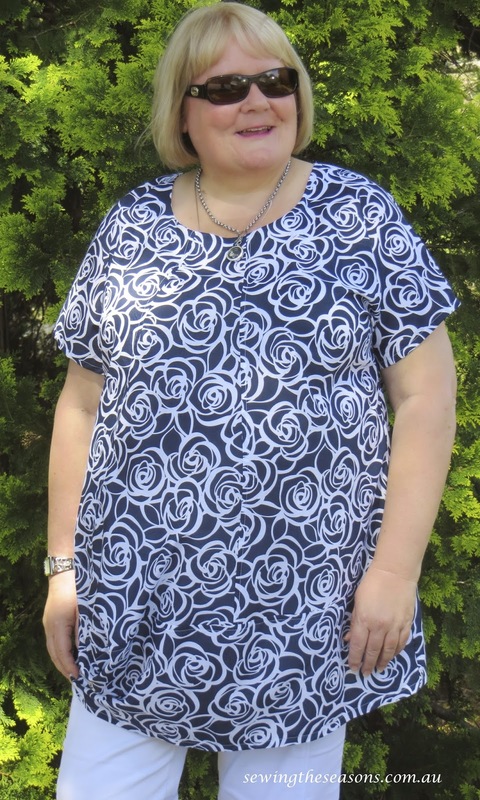 I see so many comments on line about commercial patterns not fitting, that people have to buy sizes they don't wear and their disappointment in the final fit so I knew I wasn't alone. 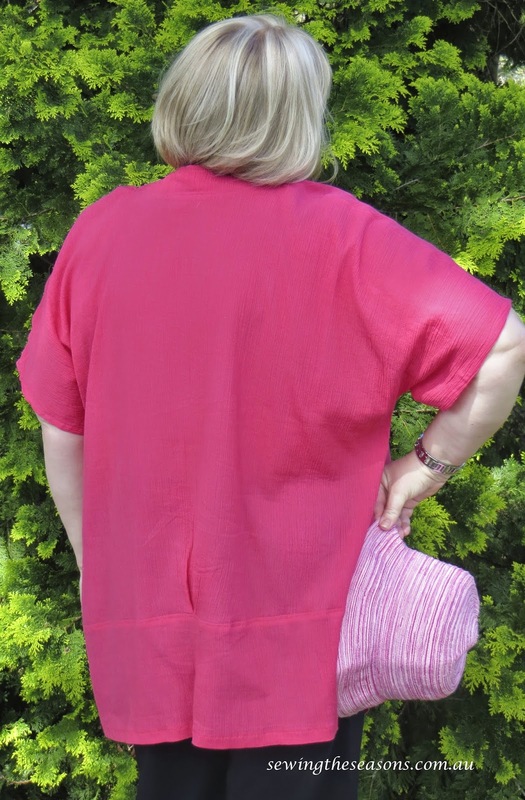 With my past experience of crazy sizing, I was a little apprehensive but decided to trust the pattern & make the size according to my measurements................and it FITTED !!!!! Yeah, a win. Her printing instructions are clear & easy to follow. There were 60 pages to download for the pattern but I settled in with a cup of coffee for an afternoon of cutting & taping pages together (I found it quite therapeutic & it took me back to my teaching days). I forgot her suggestion to cut out pieces as you went & taped the whole 60 pages together before tracing off each pattern piece but it was still fun. I added a step where I traced off my size from the paper pieces so I had the option to make other sizes using some cheap white toile from Spotlight. This is also easier to pin to the fabric. Pearl has really clear layout instructions for cutting out too. I made the collared top from cheesecloth (muslin for American readers) and it came together so quickly & easily. I see this as an ideal swimming cover up. As you can see by my photos, I didn't stop at one top ( all that was required for the pattern test) Over the next couple of days, I made two more & have extra fabric waiting to be made up. Oh, & probably worth a mention, the instructions are so clear & easy, I didn't even need to refer to them to make tops 2 & 3. 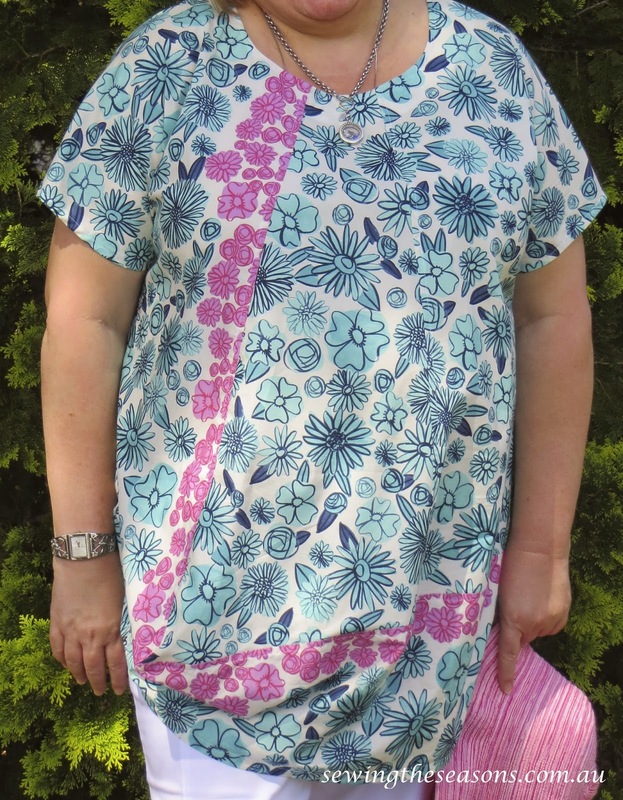 For this version I used a Cotton & Steel voile that had a strip down on edge of the fabric, ideal for the long side piece that comes across the front. 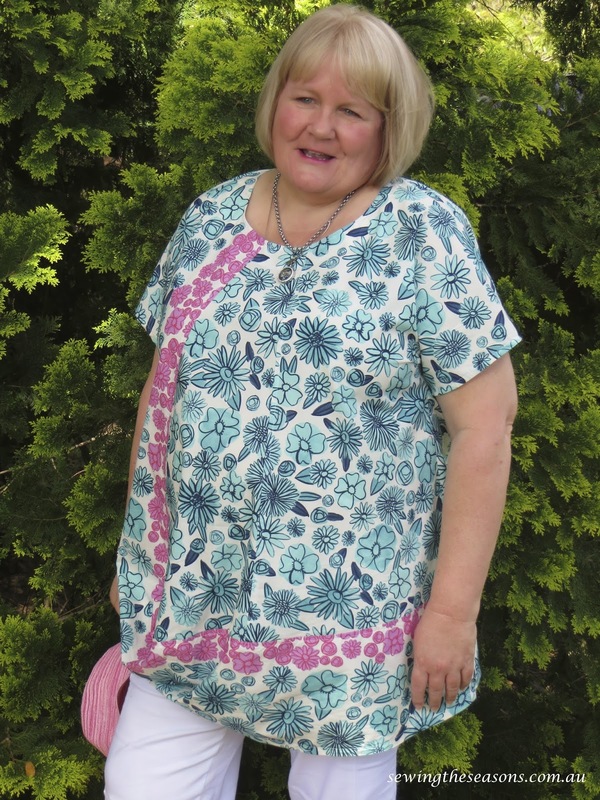 I love the relaxed fit, I pop it on in the morning, no adjusting or fiddling with it during the day & best of all, I can make it in cotton or voile so finally have some cool summer tops to wear. My 2nd & 3rd top I decided to make with the neck line facing to the inside. My gorgeous sister-in-law Lou from Blue Triangle Design (a photographer & graphic artist) took my photos for me, she has done a wonderful job as I hate having my photo taken. Here's some close ups of the collared option & see how the back sits so well with the tuck & shaping. 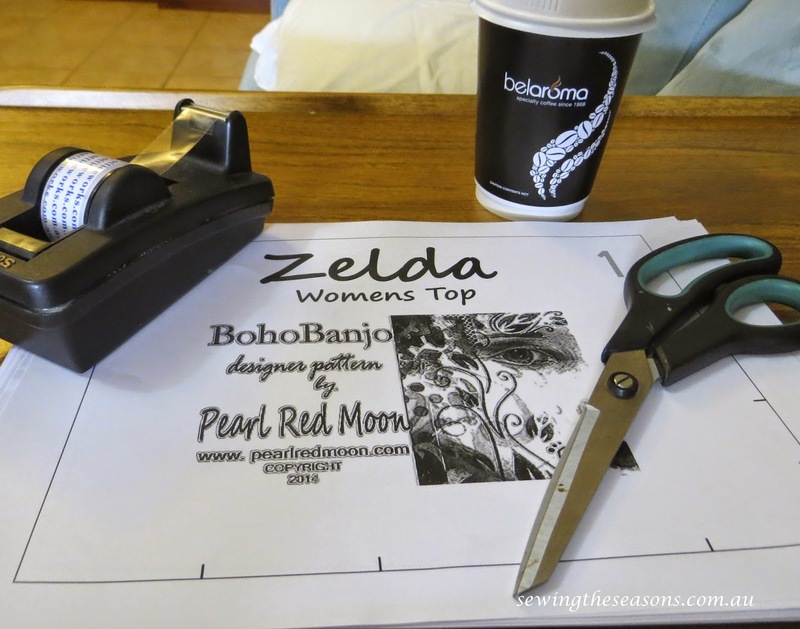 And the even better news is that Pearl has more patterns in the pipeline from her Boho Banjo designs, I've seen the next one, a dress, & can't wait to see more revealed. The Zelda pattern is only $14.00 AUS & is really great value. Why not pop on over & check it out, you will be glad you did. fabulous range of tops Robyn, well done! 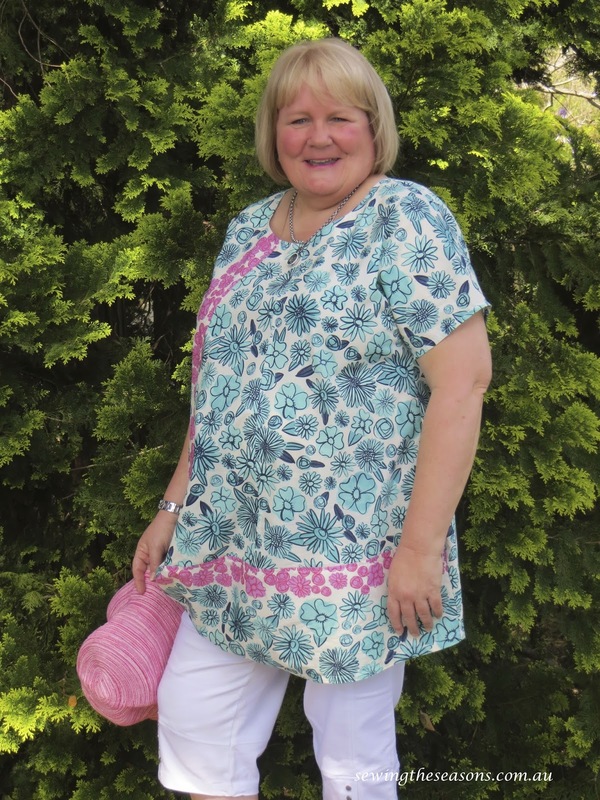 Thanks Margo, Pearl's pattern was the inspiration & is just so wonderful to wear. Thanks for this post! I'm thinking of making this pattern and wanted to see it on an actual person. Your photos are the only ones I found. They look great! 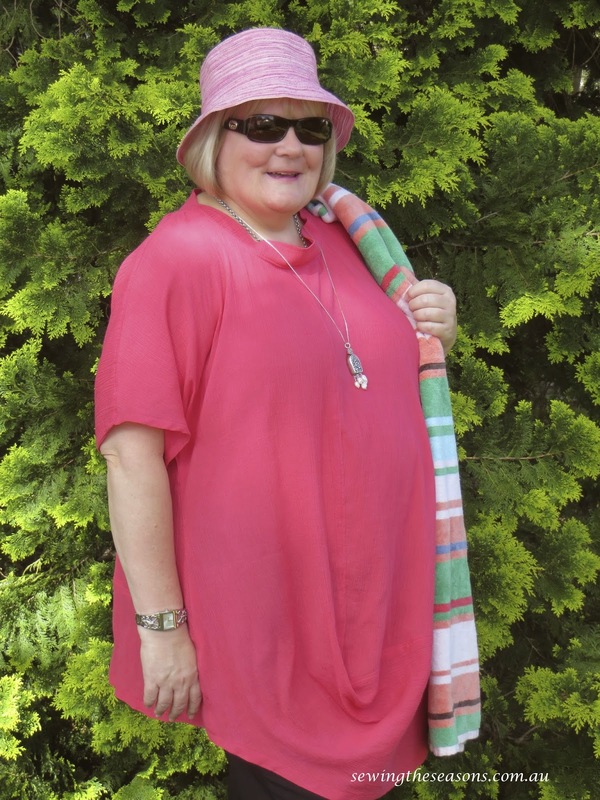 I especially love the drape of the pink muslin one.